The late Jim Camp was known as the “world’s most feared negotiator”. 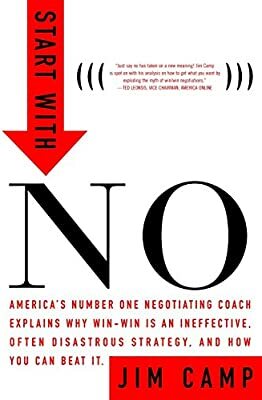 He wrote a book called, Start with NO…The Negotiating Tools that the Pros Don’t Want You to Know. It’s available on Amazon if you want to buy it. Good negotiators start by giving the other person an opportunity to say “no” at the outset. This relieves the pressure on both parties and allows the negotiation to proceed more rationally. And the good negotiator will continue to remind the other party they can say no at any time. This let’s the other party feel like they’re in control and increases the chances of a favorable outcome. If you’re selling s*** to people you are negotiating All The Time. Even if you aren’t sitting at a gargantuan mahogany meeting room table in a three piece suit and bow tie. So, if you want to take advantage of Camp’s advice, you can. You MUST make your reader say no to you. To be more precise, you must everyone who isn’t your ideal customer say no to you. At every single touch point between you and your reader, you make it clear who you want as customers and who you don’t. Your website, your photos, your social media, your blog posts, your videos, your emails. They should all deliberately repel your haters and neutral fence-sitters and attract only those who LOVE you and want nothing more than to buy from you. Now, to do this, you need to be comfortable with being polarizing. ^^Newsflash: everyone is polarizing. Only the smart ones embrace it. The dummies try to win everyone over. One way I do this is by being ratchet on social media. I’m deliberately trying to get subscribers to unsubscribe. Since I started emailing my list daily, hundreds already have. The lukewarm ones, the ones who don’t open or click or unsubscribe (70-75% of the list), I’ll remove from the list myself in about a month. Only the real Gs will remain. Sounds great, I would love to sign up for your daily newsletter and learn more about becoming the Gary Vee of my thing.